Delphi was one of my favorite cities that I visited on my family trip to Greece in June 2015. 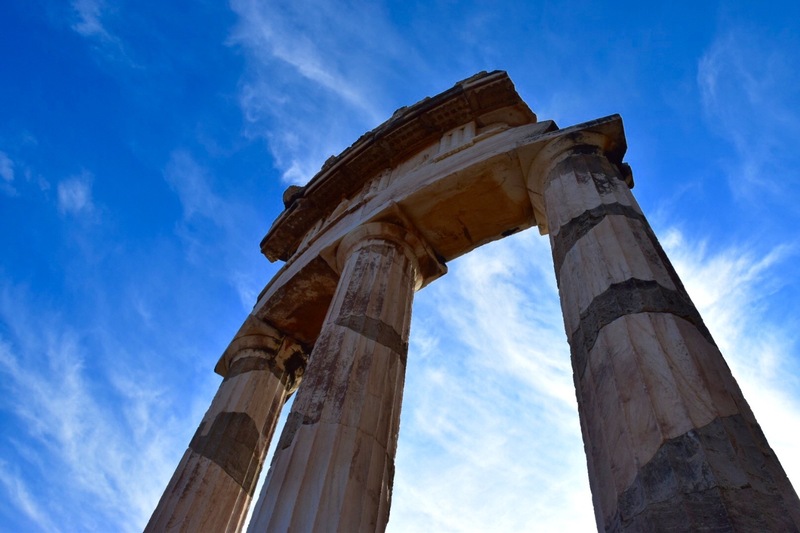 Delphi was an incredibly important city in Ancient Greece and was an epicenter of politics, architecture, and art. Incredible temples and structures were built along the side of this steep mountainside, which forces visitors to imagine how this ancient civilization was built so long ago and in such a challenging landscape. This photograph features the Tholos from 350 BC, one of the many temples of Delphi. I loved the way the remaining columns, triglyphs, and metopes of the Tholos are illuminated by the backlit sun in this photograph. The lines of wispy clouds bring your eyes up to the sky and impart feelings of grandeur as the Ancient Greeks would have wanted.